WARNING: This product can expose you to chemicals including lead, which is known to the State of California to cause cancer and birth defects or other reproductive harm. For more information go to www.P65Warnings.ca.gov/furniture. Candles not included. Holds ten candles. Two rows, five platforms in the front and five platforms in the back. Each platform is 3 in. Dia.. Sturdy base. Made from metal. Black matte color. No assembly required. 21.5 in. W x 10 in. D x 11 in. H (6 lbs.). This glamorous metal candelabra is the perfect feature to adorn any shelf or mantel. 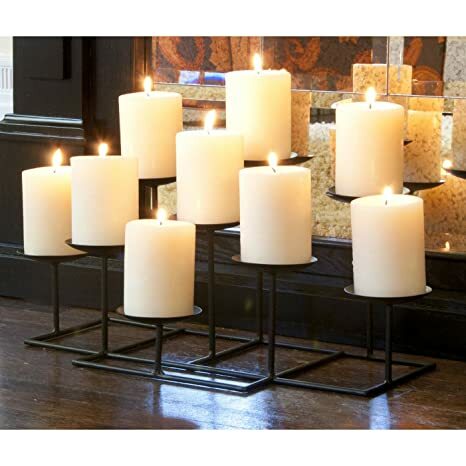 With ten platforms to hold candles, this metal candelabra will add warmth and a gentle glow to any room in your home. Two are better than one! At least that’s the case for the Bannock tables. Tripod, quadruple hairpin legs give rise to a warm, matte gray tabletop on each. 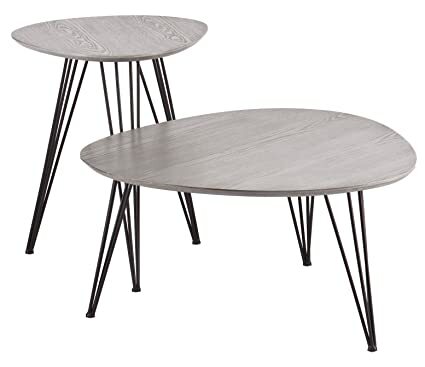 Nestle them together as a layered cocktail table or make use of them as individual end tables – one over here, one over there! This set includes 2 coordinating accent tables. Dimensions include: Overall: 31.5″ DIA x 15.75″ H (lg), 19.75″ DIA x 23.75″ H (sm); Tabletops: 1″ THK; Clearance: 25″ W x 27″ D x 15″ H (lg), 15.5″ W x 14.25″ D x 22.5″ H (sm). This one-of-a-kind item weighs approximately 16 pounds (lg), 7.5 pounds (sm)and can support up to 30 lbs. (lg), 20 lbs. (sm). Only quality materials and manufacturing will do. Product materials include: MDF, Ash Veneer, Powder Coated Metal Tube. Assembly required. Made in China. Go ahead; throw that soiree you’ve been dreaming about. 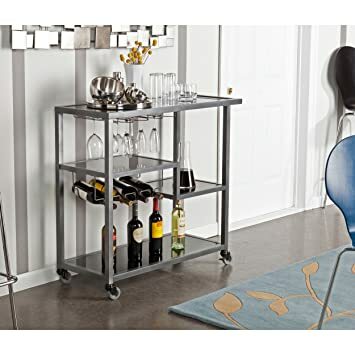 You’ll be the hostess with the mostess with this fashionable and functional bar cart. The gunmetal gray frame supports black tempered glass shelves where treats may be displayed for easy snacking. Wine bottle and stemware storage ensure a glass of your favorite Bordeaux is never out of reach. When it’s time to call it a night, locking casters and a sturdy handle roll the Zephs out of sight. This wonderful bar cart features an open, contemporary style and it can store 4 wine bottles and approximately 8 wine glasses. Dimensions include: Overall: 40″W x 16″D x 37.25″ H Top surface: 33.75″ W x 16″ D (not including handle); Stemware storage space: 19.75″ W x 16″ D x 10.5″ H; Shelves: 15.75″ W x 16″ D x 17.5″ H (middle), 33.75″ W x 16″ D x 12.5″ H (bottom); Clearance: 33.75″ W x 16″ D x 3.75″ H. This one-of-a-kind item weighs approximately 62 pounds and can support up to 40 lbs. (per shelf), 5 lbs. (per wine bottle). Only quality materials and manufacturing will do. Product materials include: Powder-Coated Metal Tube, Iron Line, 5mm Tempered Glass. Assembly required. Made in China. Well served. Keep the party rolling with the Zephs Bar Cart. Crisp white frames smoky gray glass for high contrast contemporary style. Stemware racks and bottle holders keep your breakables in place, shelves handle mixers and assorted accoutrement. Casters keep you on the move or locked in position. 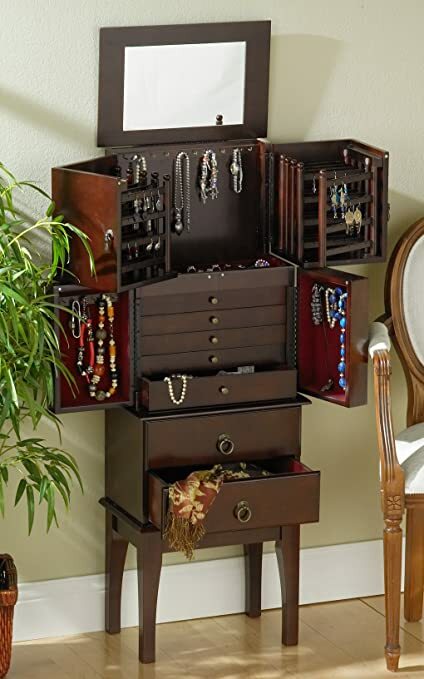 Roll with the flow with this party wagon, or mix things up; repurpose the Zephs as a coffee and kitchen accessory center, grab-and-go walk-by closet, or nightstand!. Long and lean! 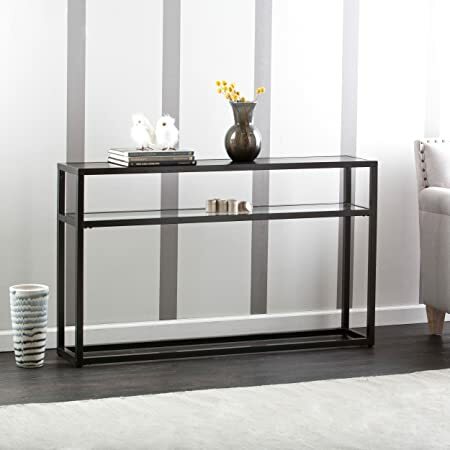 The Baldrick Console Table makes smart use of small spaces or open floor plans. Clean, linear frame and glass shelf bring a light footprint with major functionality to the table. Welcome guests at the door, host movie night beneath your big screen, or show off your favorite treasures anywhere. Three in one for three times the fun!. This glamorous metal candelabra is the perfect feature to adorn any shelf or mantel. 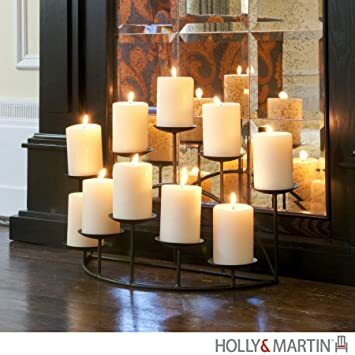 With nine platforms to hold candles and a sturdy base, this metal candelabra will add warmth and a gentle glow to any room in your home. The candelabra is constructed of layers of rows with varying heights to give unique dimension to the piece. Features: Dimensions: 21.5″ W x 12″ D x 9″ H. Each platform is 3″ W. Holds nine candles. Metal has a black matte finish. Constructed of metal. Candles not included. No assembly required. Be a total square. Add a touch of the abstract to your home with the Wavson Wall Sculpture that features squares of varying sizes in a metallic ombre finish. Hang it horizontally or vertically to fit your space and satisfy those creative desires.This wonderful item features a contemporary, geometric design. Dimensions include: Overall: 47″W x 2.25″D x 21.25″ H; Squares: 4.5″ W x 4.5″ H (lg), 3.5″ W x 3.5″ H (med), 2.5″ W x 2.5″ H (sm). This one-of-a-kind item weighs approximately 17 pounds. Only quality materials and manufacturing will do. Product materials include: Metal Tube, Iron Sheet, Iron Wire. Assembly: No assembly required. Made in China. Mix it up! 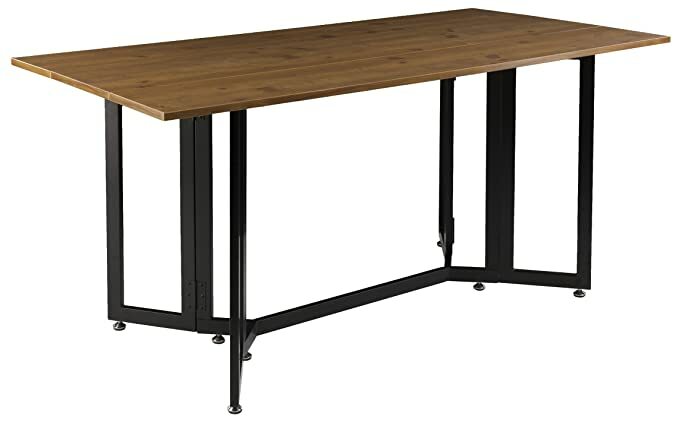 Our Lydock tables carry the fresh look of mixed materials. The clean lines and white with burnt oak finish easily match to any style. Simple frame keeps space feeling light but robustly supports life’s everyday bits and pieces or your favorite dcor. 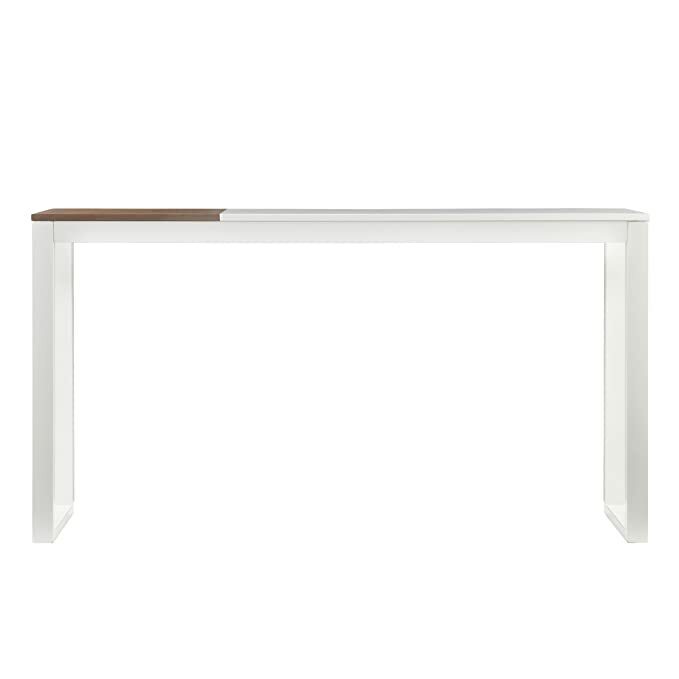 Open up small spaces with this contemporary console table. This wonderful item features a sleek, modern design with mixed materials and its square metal tube frame offers lightweight stability. Dimensions include: Overall: 56″W x 12″D x 30″ H; Burnt oak panel: 17″ W x 12″ D; Clearance: 52″ W x 12″ D x 27.5″ H. This one-of-a-kind item weighs approximately 33 pounds and can support up to 50 lbs. Only quality materials and manufacturing will do. Product materials include: MDF, Ash Veneer, Powder-Coated Square Metal Tube. Assembly required. Made in China. A leg up. With the Driness Drop Leaf Table, small space dining is a snap! 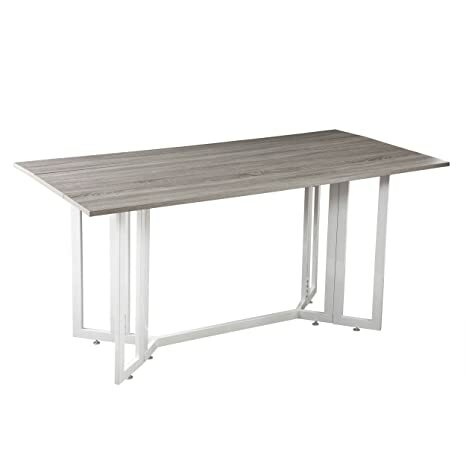 Easy-use drop leaf smoothly operates for a dining table that converts to a console in seconds. Weathered oak tabletop and black metal legs make a great team, simple lines and contemporary composition work well with any style. Feast your eyes on a good time with this gate-leg table as a dinette, table tennis locale, or desk the Driness does it all!.